Alana Smith Backflips Mini Mega Gap in South Africa! 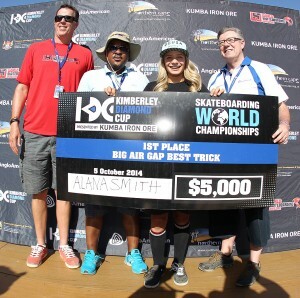 Alana Smith of USA takes first place in the 2014 Kimberley Diamond Cup Mini Mega Best Trick contest! Alana, at only 13 years of age, Alana is the first female to do a backflip over the Mini Mega Ramp gap. Alana took home $5,000 for first trick against Andy MacDonald, Jono Schwan, and more. Check some photos from the contest and out highlights video below from the contest featuring Jono Schwan’s woodchipper, Andy Mac’s cab bigspin mute, and Alana’s backflip. Jono Schwan and Andy Mac double up in practice. Sam Clark photo. Dane Burman padded down for an airwalk over the gap, so sick. Sam Clark photo. Alana Smith’s backflip was the first ever done by a female and it went down at Kimberley Diamond Cup in South Africa. Rudi Jeggle photo. Congrats, Alana! Put that money in the bank. Rudi Jeggle photo.